Is your Miniature Schnauzer suffering from dog allergies? Is your dog sneezing, constantly scratching, chewing and licking her paws, rubbing her face, and shaking and scratching at her ears? If your Miniature Schnauzer is is hypersensitive to certain substances and is having reactions, you know he/she is probably just miserable. For those of you who personally suffer from a reaction due to dust, pollen, certain foods and so on, I'm sure you can relate. 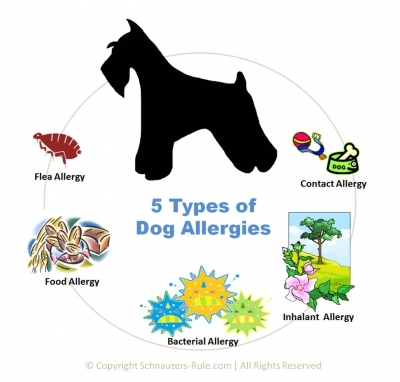 In fact, it is estimated that 25% of all dogs show symptoms or have reactions to allergens. Each type listed above can cause different symptoms in dogs from constant scratching, chewing, and licking to more serious reactions like vomiting and diarrhea. So let's explore each one further and find out what we can do to end our pet's suffering. Many dogs are hypersensitive to certain foods or ingredients including chicken, beef, fish, eggs, pork, turkey, milk, corn, wheat, whey, and preservatives, to name a few, which cause them to suffer an allergic reaction. The good news is food allergies are the easiest to treat. dog health tip: One reason many people overlook their dog's food as the culprit, is because they are still feeding the same food, as before the allergic symptoms began. But food allergies can develop overtime, so don't rule out your dog's food as the culprit. In order to determine if your dog is suffering from a food allergy, you will need to put your Miniature Schnauzer on a special diet for a month or two. Discuss with your Vet about putting your dog on an elimination diet. The elimination diet is basically removing or eliminating certain foods from your dog's diet in order to determine what food(s) is causing the reaction. Most than likely your Vet will have you feed your Schnauzer anti-allergy foods like oatmeal, salmon, sweet potato, pumpkin, venison, lamb, and brown rice. Of course, there is no guarantee that these foods will not also trigger a reaction in your dog, just that they are more likely not to. If during this trial diet your Miniature Schnauzer's symptoms improve, you know there is some ingredient in your Schnauzer's dog food causing the allergic reactions. Next, you will need to re-introduce foods (one at a time per week) until you can determine which food is the allergen. For instance, add beef for a week, if your Miniature Schnauzer has no reaction then add wheat for the next week. Once the food allergen is discovered, look for commercial foods or prepare your Miniature Schnauzer dog's meals MINUS those ingredients. Books providing: Homemade Recipes for Dogs is another good choice for those of you wanting to prepare your dog's food at home. Home-prepared food can make a big difference in your Schnauzer overall. Also supporting your dog's immune system with digestive enzymes and probiotics is always a good idea. Digestive enzymes do just that... help your dog digest the foods he's eaten. Enzymes break down the food elements (protein, carbs, fats, oils, sugars) to enhance and maximize nutrient absorption. And probitoics (the beneficial bacteria) will help to maintain a healthy gut and digestive tract in your dog by cleaning the system of toxins so the nutrients can be absorbed. If you feed your Schnauzer commercial pet food, choose from allergy formula dog foods that are designed especially for dogs with sensitivities to common pet food ingredients. Learn to read dog food labels carefully and consider rotating or changing from a few different brands so your dog is not always eating the same food every meal, which can actually cause a food sensitivity to develop. It is not uncommon for dogs to have a flea allergies. The reaction is not from the flea itself per se, but from the flea's saliva. Most dogs have some type of reaction from flea bites but luckily they are just minor. But if your Mini Schnauzer has a severe reaction to fleas, you know just how miserable he must be. The itching is usually so intense that some dogs scratch and chew on themselves to the point of causing sores and hair loss, which can also lead to an infection. In order to prevent this from happening to your Mini Schnauzer, strict flea control is necessary. All fleas must be removed from your dog and his environment. Of course this is easier said than done since fleas multiply at a very fast rate. Did you know just one female flea can produce enough eggs to infest an entire home! So it is extremely important that you not only treat your dog for fleas, but your home (especially carpeted areas) and your yard, too. Housekeeping Tip for Fleas: Sprinkle flea powder into your vacuum bag and vacuum daily. The powder will help to destroy the fleas inside the vacuum. Eggs... Adult fleas lay 20 to 30 eggs a day! Larvae... worm-like form hatches from eggs. Pupa or cocoon... protective covering until maturity. Adult Flea... ready to populate and feast on your dog. And then the cycle repeats itself. Groom your dog regularly: use a flea comb and bathe your Schnauzer regularly. Keep your dog out of tall grassy areas and woods where these insects are just waiting for a warm body to latch onto and begin feeding. Vacuum thoroughly all areas of your home (especially dog bedding). If you have a bagless vacuum cleaner, empty and dispose of the contents right away after each use. Treat lawns with yard flea control. This is especially important if your Schnauzer spends a lot of time outside in the back yard. 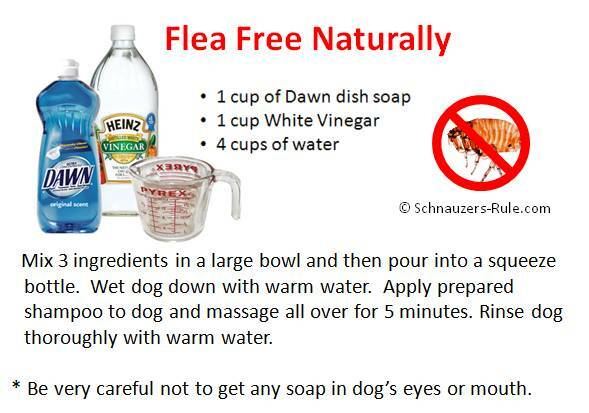 Use flea medication. Just be cautious about what type of flea medication you choose to use on your Miniature Schnauzer, as many have been linked to more severe side effects including: hair loss, seizures and even death. Ask your veterinarian which flea medication would be best to use on your dog. Or choose from natural flea control products which are safe for your home and pets. If you have completely eliminated fleas and signs still exist that your Miniature Schnauzer is having a reaction, it could be your dog is allergic to something else, as well. Many dogs with allergies, suffer from multiple types so you may need further consultation with your Veterinarian. Bring a pot of water to a boil. Remove from heat. Add sliced lemon to the pot of hot water. Cover and allow it to steep overnight. The following day, strain the fruit. Then add the liquid to a spray bottle and apply to your pet. Be sure to avoid getting any spray into the eyes. You can also apply the treatment by dipping a sponge or pet brush into the liquid and then applying it to your pet. Repeat daily or as needed. So why does this work? Lemons contain d-limonene, a chemical that acts as a natural insect repellent. It works to kill and repel fleas, ticks, and mosquitoes. D-limonene is found in citrus fruits (grapefruits, oranges, limes, lemons...) ie You can make this natural flea spray using oranges and grapefruits, too. Kill adult fleas feasting on your dog quickly and naturally with this homemade dog shampoo. Did you know it is normal for a dog's skin to have Staphylococcus (Staph) bacteria? This bacteria usually causes no problem for the dog with a strong immune system. But if a dog's immune system is weakened, it may develop an allergic reaction to this bacteria causing dog skin problems. If this happens, your Schnauzer may begin to suffer with a dog skin allergy with patches of hair loss, similar to ringworm, plus your dog's skin may begin to emit an unpleasant odor. Your veterinarian can perform a blood test to determine if your Miniature Schnauzer suffers from a bacterial allergy. If test results are positive then your vet will prescribe antibiotics to treat it. You could also check into using holistic herbs that work to fight bacterial infections, clean toxins, and offer relief to pets with chronic itchy skin, paws or ears due to allergies and those that have been treated with prednisone and/or antibiotics repeatedly. Read Mini Schnauzer Lexi's story: My Cure for Dog Skin Allergies using Chinese Herbs. note: Sometimes allergy symptoms of itchiness and redness on your dog's skin, ears, and feet could be caused by yeast problems. Get further info about Yeast Infections in Dogs. The most common of the dog allergies is the inhalant type. It is caused by inhalant allergens from environmental factors such as dust mites, molds, mildew, pollen, etc... (also known as Atopy). Your Miniature Schnauzer's Veterinarian can perform an intradermal skin test to determine which antigens are causing your Miniature Schnauzer's reactions. Itching is the most common symptom of a dog suffering with an inhalant allergy. But again, the constant scratching can lead to infections that can cause pain and discomfort to your dog. Treatment options for atopy (depending on the cause) include frequent baths with medicated or hypoallergenic shampoos, allergy shots, steroids (cortisone), antihistamines, and adding fatty acids to your Miniature Schnauzer's diet. note: Please do not expose your Miniature Schnauzer to cigarette smoke. Allergic reactions from a contact allergen include: redness, itching and swelling. Areas of the body most affected are the dog's face, paws, and legs. Your vet will do a skin scraping to rule out other causes. 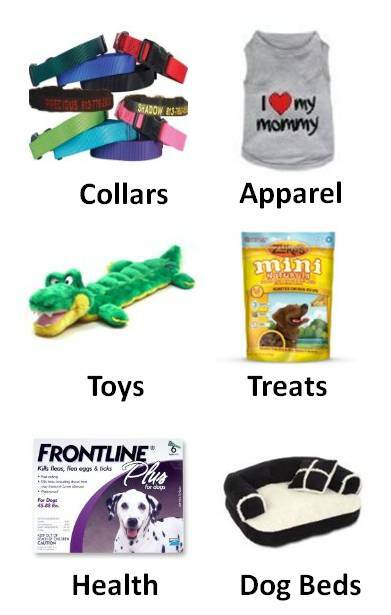 Treatment is easy enough for this type of dog allergy ..... simply remove the item from your Schnauzer's environment. But that is more easily said than done. Since your dog can't tell you what's causing the reaction, you will have to try and determine that on your own. Try keeping a journal of your dog's activities. This way when you see your dog scratching excessively you will know what he was doing just prior to the reaction. A bit of detective work on your part will help figure out what item(s) are the culprits.